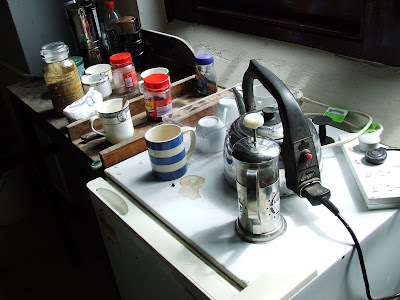 Coffee - as sweet as love, as black as night and as hot as hell! Alternative transport! Seen outside Red Rooster. A pair hitching a ride. Are the leaves there to provide shade? Also, no one arrived by crane, in the background, it's used for putting up Christmas decorations. WAR on the HILL? FAR on the HILL? BAR on the HILL at the university. 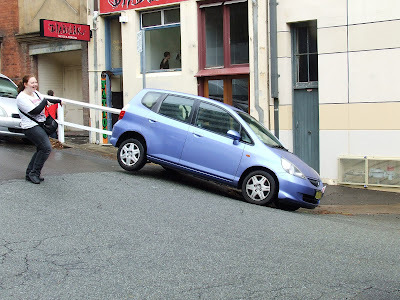 Vertically, spatially and subliminally unrelated to The Hill (inner city)? 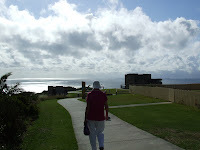 High above the Pacific Ocean and the Tasman Sea is the volunteer coastal patrol on The Hill. Behind there are old WW2 defences. (Contact with 'the enemy' has been documented.) By and large, the present day patrol is for recreational boating. Below. 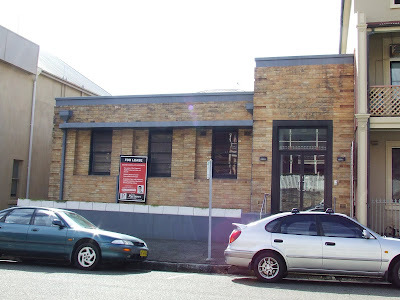 Long ago, The Australian Broadcasting Corporation vacated this address in Newcomen street and moved west. Although some say they have moved to the left! If so, not left of left. 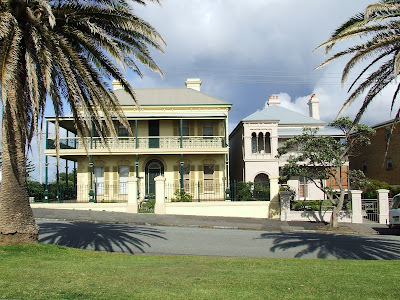 Once did the State hold substantial residences in fee. 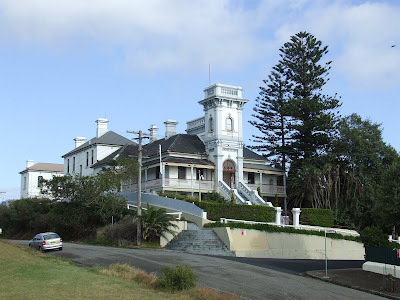 Hill House on The Hill was associated with the former Royal Newcastle Hospital. 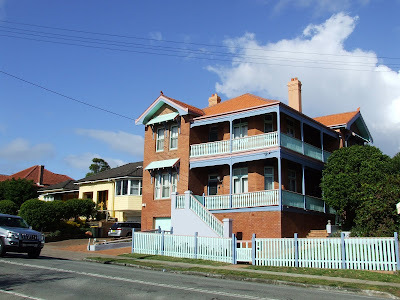 The other address, also on The Hill, acted as the residence for the medical chief of the former Royal Newcastle Hospital but I guess that situation has well and truly changed. A past superintendent of the hospital and his staff were hughly innovative but then he had very troublesome times. As well, his wife had a very unfortunate death but then he found love again. Two times or twice? Lately, all we hear said is two times. It is said that the bricks for this house were imported from England. 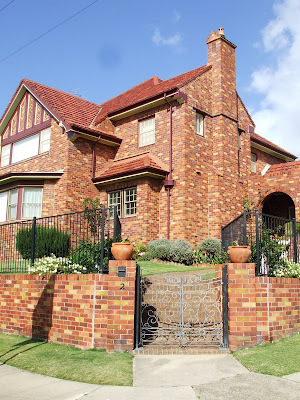 Rightly or wrongly, as to the masonry and the design, it is one of only a few such homes in Newcastle and is evocative of things British. Is it from the 1920s, 30s or 50s? 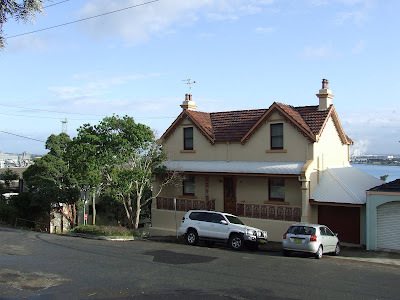 A house and garden built in the boom years around 1900 not far from Newcastle in East Maitland. The artist Margaret Olley is said to have owned it at one time when she acquired a number of properties in Newcastle and district. As a generous patron of the arts, we often hear of the acquisition of works made possible by Margaret Olley who enriches our enjoyment of art. 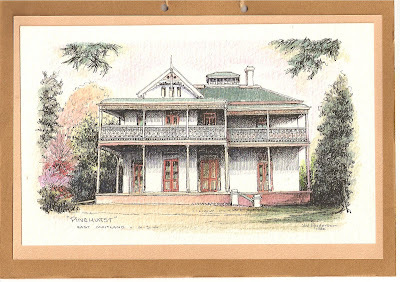 This work is signed by Val Anderson who sketched historical buildings far and wide in the Hunter Valley. The artist Margaret Olley sketched this property in Church Street Newcastle. Olley is not an avant-garde modernist. 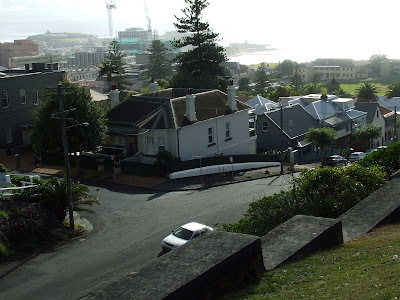 Nowdays it is more difficult to catch the same views of the harbour (or Port as they say). 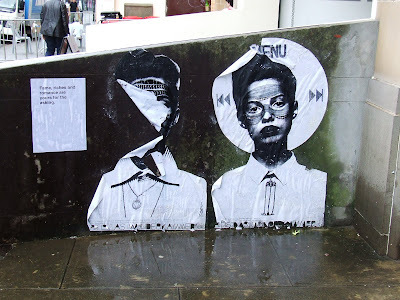 The artist became interested in real estate in Newcastle. In 1944, the Archibald came under fire when it was awarded to Dobell for his portrait of Joshua Smith. It was denounced as a caricature. Contempt for modernists emerged. However, Dobell went on to win with his portrait of Olley in 1948 (shown in a previous posting here). Just imagine anyone protesting about art, any art, in the here and now. Where's all the fire? Meg Stewart: Margaret Olley far from a still life.2005. Random House. Jesmond House and Ordnance Street was sketched by Margaret Olley. The rear side of the buildings was also sketched as seen from the high ground around the obelisk. My photo from that vantage point is unsuitable after all that. Below: William Dobell Margaret Olley 1948. Winner of the Archibald Prize. Oil on hardboard. Art Gallery of NSW. Those with controlling personalities are a strange breed yet this is only one of many characteristics we all have. Maybe the trait is not confined to the older generation, but, for instance, what about those who won't even allow their elderly partner to use a walking stick? Cancer or whatever - it makes no difference, appearance is everything. What about the Australian artist, Margaret Olley, way up in years, photographed using a walking frame, in Egypt, with the pyramids in the distance? 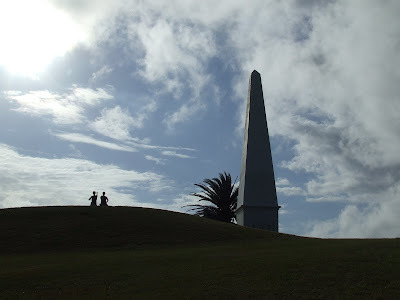 When she was younger she would have visited this Egyptian Obelisk without any assistance for that was back in 1970s when she lived in Newcastle for a time following extensive visits abroad. From this vantage point several line drawings of Newcastle were made by her and are exhibited in the Newcastle Gallery at present. 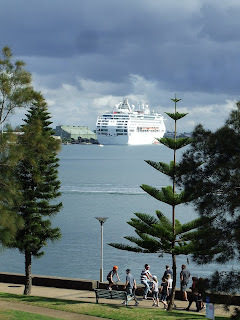 In a parallel universe, this weekend, the natives have offered 'enticements' to the sailors on their south Pacific cruise moored beside the dykes in the Port of Newcastle under monsoon skies. Casey Stoner is on the front row of the grid at Philip Island today and some other events add up to good weekend. Go rev heads! 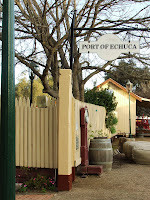 The Port of Echuca on the Murray River has become a theme park. Above is the Log Buggy and below are bales of wool on a cart. The Murray forms the border between the states of NSW and Victoria to the south. 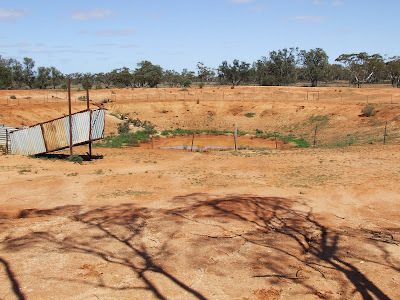 Waterhole near Round Tank Picnic Area and goat trap. Water attracts wild goats (non-native) who roam the outback in large numbers and cause major damage to the vegetation. All the same, feral goats are forging a reputation as a valuable commodity says the journal Australian Geographic, for their resilience and adaptability in drought-ravaged parts. The meat is exported and has a large international market, most of it going to Taiwan and the USA. Goat meat is not commonly seen on our shelves. Where's the emu? 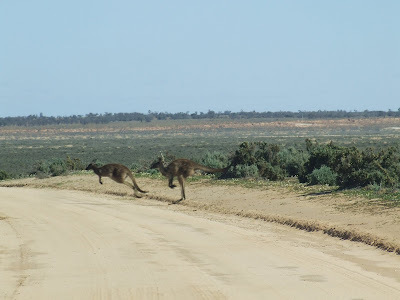 They were in Mungo National Park. 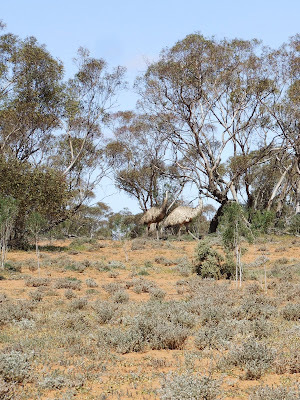 The scene changed from the lakebed and saltbush to zones with several species of trees and mallee scrub and the plant and animal communities they support. Hugh non-native rabbit populations have been controlled. Unlikely as it seems, deep floods have been recorded at Allen's Plain Tank. 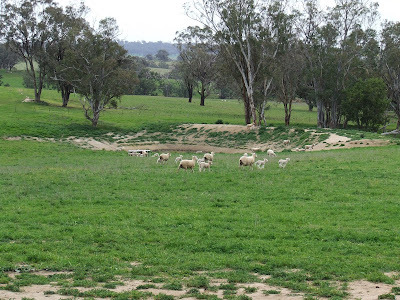 The wide surrounding countryside, in the vicinity of the Willandra Lakes World Heritage area, was seen to be flat and waterless but as visitors, we are unfamiliar with the potential for change and floods. The Murray-Darling Basin accounts for three-quarters of the country's irrigated crops and pastures, and one-third of its agricultural output. The basin's annual water flow ranges from 5000-57000 gigalitres. Research shows over-allocation of this water underpins widespread biodiversity losses and damage to the environment, much of which may already be irreversible. From Australian Geographic journal. A flood swept throught the Western Region in 1890, especially around Bourke, and is the subject of the painting by W C Piguenit: The flood in the Darling 1890. The work is described as one the the Gallery's (of NSW) great icons of Australian painting. The Darling is a major river. The sky is notable and the reflections and birds are from one in touch with nature. Piguenit was the son of a convict and is credited as our first professional Australian born painter. An historic bushranging incident in the region of the Newstead property (of The Golden Fleece fame). Roberts had trouble selling the painting and in 1927 he recast the background for a flattering frieze-like effect. Often the surface soil was of fine red 'cornflour' and was voluptuous and cushioned the Michelins around the curves of the drive in the National Park where trace of ancient megafauna could be sensed (such as the giant obese wombats and the towering kangaroos) and all the roads led to Vigars Wells in the middle of nowhere to the path taken by the horse drawn coaches. There any romanticising of the west dissolved away. The deserted dry outpost was windswept. Why did the old coaches cross the sand dunes instead of taking an easier path? Even today compacted wagon wheel tracks are still visible. Imagine the strain on the horse teams. Vigars wells (in the previous photo) were build at a natural soak and were a vital watering and resting point used, for instance, by the famous Cobb & Co coaches whose services linked settlements literally from one end of the country to the other (in the eastern states). By 1870, Cobb and Co were harnessing 6 000 horses per day and were covering 45 000 km each week. 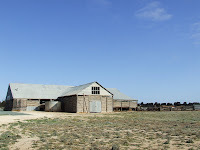 They moved the station people (farmers and pastoralists), shearing teams, wool buyers and public servants. 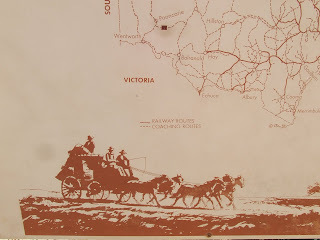 The last coach ceased operating in 1924 in North Queensland. 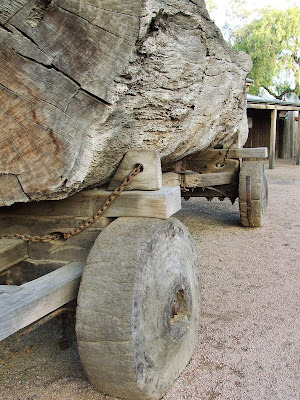 Slower wagons drawn by horses or bullock teams took wool to the river ports of the Murray river and river boats cut the delivery times to Adelaide by as much as 3 months. Vigars Wells. 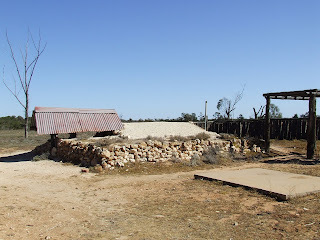 A viewing platform surrounds an old well. A natural soak has long been a watering place on the edge of the sand dunes. This is Drysdale's take on a scene, similar yet very unlike, the one in the previous post. He made a number of famous paintings of the outback in very stark terms. 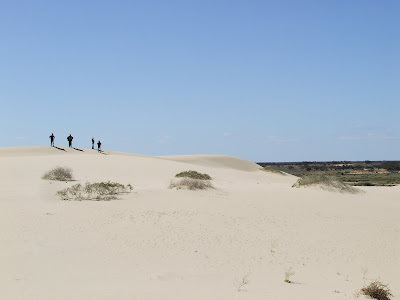 A dune extends across the horizon on the old 'shore' of Lake Mungo in the National Park. This lunette was dubbed the 'walls of China' and while it is a special rather than a sensational sight it holds buried 'treasures' from pre-historic times. Over the centuries, the wind has carried layers of deposits and where these are eroded are revealed rare human and animal finds. 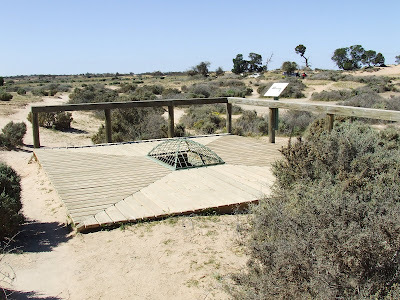 Also, the site contains more than 450 well-preserved footprints of groups who lived at the height of the last ice age in an area, in the SW of the state, now declared overall as the "Willandra Lakes World Heritage Area. Labels: Aborigines, environment, history, Lake Mungo, Parks and Wildlife. The interior of the continent has extensive sandhills, I read, that are massive and underlie the landscape and are parallel in formation. Contrasted with those are much smaller areas of crescent shaped dunes named lunettes. This is part of a lunette on the shore of a dried-up lake bed and formed by the prevailing wind over Lake Mungo. Wool transport in another age with detail of the heavy toil and a man, with a whip, on foot and a dog tagging along. Underground room as a cool retreat and store room. If I were a sheep what would I think of my life on Gol Gol Station with black bluebush (sic) as far as the eye could see in a god-forsaken landscape, forty degrees C in summer and minus C in winter, sand and red soil with little water and amazing endless cloudless azure skies above. 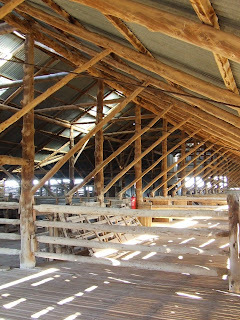 With up to 50 000 others in a season, in dust, flies and barking dogs our mob trotted and leapt into capitivity in the shearing shed to be chosen for one of the 30 shearing stands and the hand shears, shorn then pushed down a shute into the talley pens. Later we were alarmed by the steam engines that powered the shears and the stands were reduced to 18. Next it was only 5 with the introduction of diesel power. 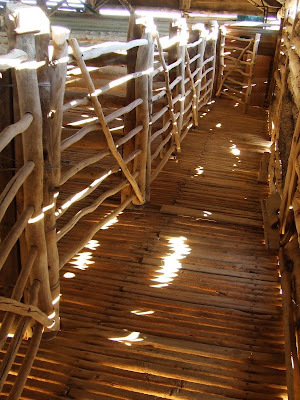 We were overstocked at times and trampled the fragile environment, never meant for our hooves, and tried to survive drought and the harsh landscape. Our boss had a beautiful wife and a flash car and got out of here for the day or retreated to a cool underground room at the height of summer. 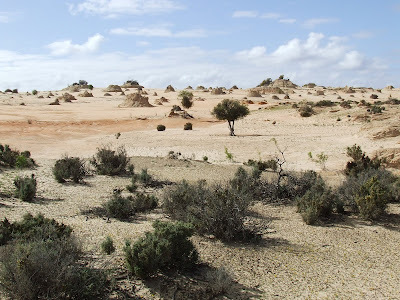 After all that, demand for wool growing changed....declined....ceased....our lands have returned to the kangaroo and emu, to anthropology and tourist nature lovers and the new boss is the Lake Mungo National Park. 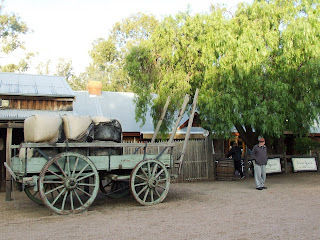 Visiting the outback and meandering in a flat-earth land it was timely to discover an unexpected, unwarranted and gratuitous sense of history. 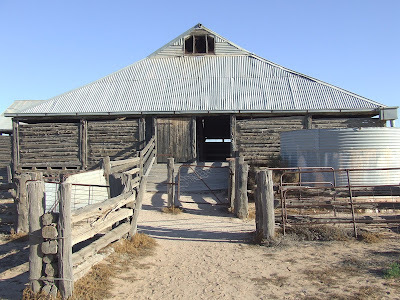 The woolshed sat still, soundless and empty yet revived a sixth sense and the space became busy once again just like the Tom Robert's painting. Tom Roberts. The Golden Fleece 1894. Oil on canvas. State Gallery NSW. 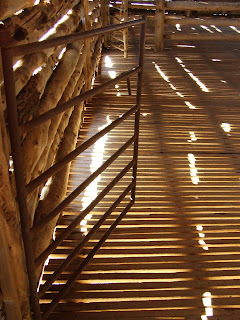 Inside the woolshed or shearing shed in the afternoon sunlight of spring. 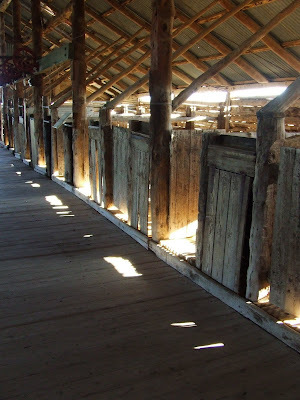 Close to the shearers were small holding pens where the floor was of slats. So behind each shearing stand were these catching pens enabling the shearer quick access to the unshorn sheep. These sheep were 'calling' to each other and were much more 'vocal' than expected by this photographer. Lambing appears to take place in early Spring while the weather is very chilly. Merino sheep were seen around the Parkes area possibly grown for their wool. On the other hand, lamb meat is retailing up to $29 per kg. We were accustomed to plentiful reasonable priced meat supplies and had it lucky for a long time. Coles supermarket states the meat is on special! In recent horrible drought times, sheep were put down and culled yet maximum prices still remained the norm. Not so bad if the profit goes to the farmer but does it? No doubt the bells will toll as a result of the tsunami. 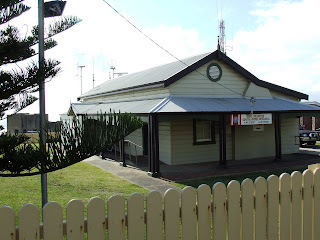 Shown is the Free Wesleyan Church of Tonga in Glendenning, Western Sydney. 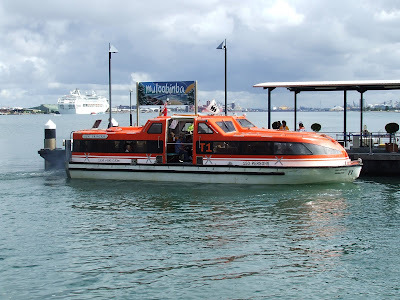 The Pacific Island communities of Tongans and Samoans are numerous and from Australia they financially and otherwise support their extended families back in the islands. Labels: architecture, current affaires, religion. 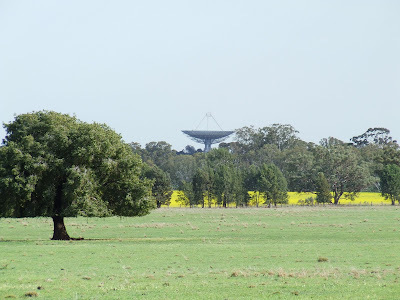 Parkes Radio Telescope takes on the usual vital roles with a vantage point from this outpost on the 'ends of the earth'. It starred in the lighthearted film The Dish with stuff about the moon landing.